The Emmett Technique with Alice Hartley – Emmett Technique Certified Advanced Practitioner and Emm-Tech Tutor. 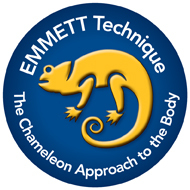 Although relatively new in the UK, the EMMETT Technique has built a strong reputation in Australia and around the world over the last 20 years of being an effective means of resolving pain and discomfort. Used by many therapists and increasingly by those in the medical profession itself, it is proving to be an extremely effective treatment for releasing muscle tension, reducing pain and speeding up the recovery process. The technique itself involves non-invasive, relatively light touch of precision “points” on the body that allow the system to recalibrate its tissues and correct its alignment via the neurological system. Changes can be achieved quickly and profoundly. It has to be received to be believed – its results are quite extraordinary! Why should I choose The Emmett Technique? Reduction in pain and restrictions in the body. Emmett Treatment – What’s involved? Homework is often given to assist the body to take on the changes in posture. Contact Alice Hartley to find out more about Bristol EMMETT or make a booking. Emmett Technique is the “new kid on the block” for relief from pain and restriction!